Nearly every baker has been there. You've spent hours looking through recipes, grocery shopping and baking a cake, only to find that the finished result is as dry as the desert. Some recipes are bound to turn out drier than others, but there a few universal tips to making, and keeping, your cake moist. Baking a cake requires science; if you use too much or too little of one ingredient, the entire end result is ruined. One main cause of a dry cake is using too much flour. 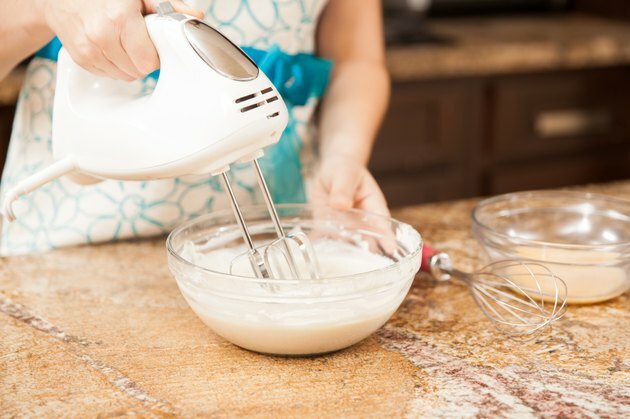 Measure the flour carefully and level off the top of the measuring cup with a knife so you don't accidentally add more than the recipe calls for. Too little liquid will also cause dryness. Don't attempt to cut the calorie or fat content by using less oil than the recipe calls for; instead, try using applesauce in place of oil, which will keep your cake moist and cut the fat content. Egg whites can also make a cake dry, so try using one less white than your recipe calls for. Once you have all the ingredients assembled, mix carefully. After you add the flour to the bowl, stir or beat the ingredients just until everything is combined. When flour mixes with liquid, it forms strands of a substance called gluten. The more you beat the mixture, the more gluten forms, and too much gluten makes your cake tough and dry. It's important to fill your cake pans properly as well; using too large of a pan means you'll have to bake the cake too long. Fill each cake pan between one-half and three-fourths of the way full; if you don't have enough batter, you'll need to use smaller pans. If you find that things you bake often turn out burned or dry, buy an oven thermometer. Testing the heat of the oven with an independent thermometer may reveal that your oven is getting hotter than the temperature controls show, causing you to overbake your cakes. Once you've preheated the oven to the correct temperature, put the cake in and set the timer for 10 minutes less than the recipe dictates. When it goes off, slip a toothpick or the tip of a knife into the center. If it comes out clean, take the cake out; if there's batter on the knife, return the cake to the oven and retest it every two minutes. Even a perfectly-baked cake will start to dry out within hours if it's not properly stored. Think of frosting as a sealant against dryness. It's important to let the cake layers cool completely, but frost them as quickly as possible once they're cool. Invest in a cake keeper with a cake plate and an airtight cover. As soon as you cut into the cake, the exposed cake will start drying out. Coat the cut edges with frosting or press plastic wrap against them. Keep the cake keeper sealed whenever you're not slicing up a piece of your moist and tasty treat.